Lock in a great price for Desert Berber Fire-Camp – rated 9.3 by recent guests! AMAZING EXPERIENCE and value!!! Highly recommend! Rode camels our to camp which was beautiful, enjoyed a few hours basking in views of sahara and sand surfing. Group dinner with other members also staying, star gazing, followed by camp fire and drum circle with singing. Got ride back early due to our travel schedule, are delicious breakfast and had room to shower and change. The location of the camp. The ride in camel was long and by the dunes. The breakfast was very good. Mohamed and his team provided an incredible experience. Anything we needed was ready for us immediately. Hungry? Food suddenly appeared. Need to leave early? A truck was waiting at dawn to take us back to base. There was no extra time taken to give unnecessary instructions. We just got on camels and were taken out to a beautiful camp in the desert. We loved the sand boards available, the star-gazing and the food. The food was some of the best we had our whole trip in Morocco. One of our original party couldn’t make it so Mohamed adjusted the reservation to account for this. We were very grateful for the flexibility. Location, location, location, and the staff was great. We spent a fantastic day with these guys in the desert. They waited us with fresh tea, even we were late a little because of traffic conditions. Later, when.the camels were ready we have been taken to the camp on the camels. Unfortunately the weather was not the best (it was too windy) In the camp we could walk a little before the dinner was served. The dinner was perfect with soup, salad, tajine and fruits. And the show after dinner was unforgettable. Next morning we watched the sunrise and played some sandboarding. After returning to the main building we could have a breakfast and a shower. I can absolutely recommend them! Everything was perfectly organized and the hosts made all the efforts to make us fill great: starting from the fire camp, camel excursion to the dinner and drums lessons with some local "artists"
We reached Merzouga in the mid-afternoon. There we were welcomed with tea and pastries in the support structure where we left the car with our luggage for the night. Afterwards we were off to a 1h camel ride into the desert until we reached the camp. 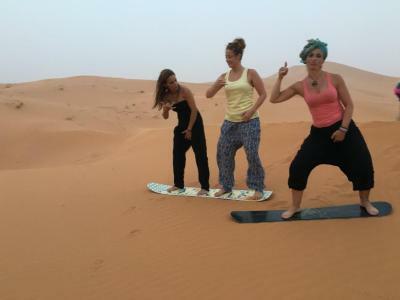 At the camp there is the possibility to try sandboarding and to explore the dunes. The staff prepared us a large and tasty dinner and then offered a berber music show. The staff was attentive and helpful, but never insistent. The guide during the camel ride was very nice and took beautiful photos of us. In the morning we took the camels back to Merzouga where breakfast and showers were available. One of our best sellers in Merzouga! Offering a restaurant, Desert Berber Fire-Camp is located in Merzouga. Shared bathrooms also come with a shower. At Desert Berber Fire-Camp you will find a 24-hour front desk. Other facilities offered at the property include a tour desk. An array of activities can be enjoyed on site or in the surroundings, including hiking. The property offers free parking. A dromedary tour is included. This property is also rated for the best value in Merzouga! Guests are getting more for their money when compared to other properties in this city. 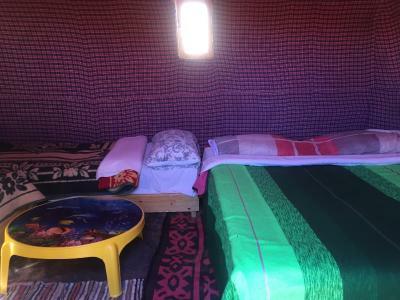 When would you like to stay at Desert Berber Fire-Camp? This tent offers a shared bathroom with shower. This tent has a patio, dining area and sofa. This tent features a view, seating area and sofa. Camel Trekking in Merzouga is your true license towards an exceptionally authentic experience of Morocco. Let’s make your travel dreams come true Camel Trekking in Merzouga is a small tour company based in south-east Morocco. House Rules Desert Berber Fire-Camp takes special requests – add in the next step! Guests should contact the property for location indication. Please note that a dromedary tour is not included. As expected real dessert experience, the place was clean and comfortable for a camp site, the staff was nice and helpful and the food offered was lovely. From the page description it was not clear if camel ride was included in price (we had to pay extra). But even with that we left supper happy. The organization was amazing! You are arriving to the pre-desert hotel in Merzouga. There you have toilet, showers, free tea/snacks, a lunch for a good price. You will be asked to pack things for one night in a tent. Rest will be left in the hotel. When time comes, you get on the camels and go into the sand dunes. The ride is around 1-2 hours. Make sure to keep phone and camera close, so you can take photos! At the tent in the dunes you have water, toilet, lights. Till the evening time you can climb dunes, do sandboarding, take photos, play drums. At the evening a diner is served + a performance is organized. There are nice and soft beds, warm blankets in the tents - so it is actually a very luxurious camping. Before heading back, make sure to check the sun rise. After a 1 hour camel ride back you are at the pre-desert hotel. Here you can take a shower, get breakfast (was included) and continue exploring Morocco. Now your life is divided in two parts - before and after you have been in the desert! Delicious dinner & perfect entertainment with traditional instruments and dances around the fire under the sky. Location to desert is amazing.walking distance to first dune only 3 min. The food is incredible!!! Best tajines in morocco!!! Beware that only breakfast is included, lunch and dinner are not included in the price. You can totally miss the jeep tour, nothing special. Nice, friendly and super helpful staff. Beautiful and unique experience. Unfortunately, the weather was severe. Strong wind caused sand storm. Staff and camels were friendly. Camel ride, took more than an hour, was exciting. Dinner with Berber music was unforgettable. Everything was as we expected! Friendly people, amazing landscapes and tasty food! The tour that they proposed is way to expensive. The guide doesn't really know the answer to our questions and was pretty dangerous in the dunes. Would not recommand at all. Everything was perfect! Very comfortable rooms in the middle of the dunes. Great breakfast and dinner. Would recommend to stay 2 nights at least! Simply AMAZING! The trip of 1:30 hours across the dunes of Sahara on the dromedary caravan has been very exciting, but to coming back to the riad from the Berber camp we chose to try the 4x4 having a lot of fun as well (even if it was very short). The camp of fully equipped and the atmosphere was warm and friendly, thanks to the owners of the camp. At the camp, we shared with the other guests great moments telling the stories of our trips in Morocco. The night is very cold in the Sahara (5/6 degrees) but thanks to a lot of blankets we slept in one of the most beautiful landscapes in Morocco. The breakfast at the riad consists of a great buffet with different dishes and also the Moroccan crepes (Choumica). Recommended!! When we arrived, Mohamed told us that we could use the turbans, however, when we checked out, he charged us 5 euros each. This is bad and lack of honesty, I felt cheated and stolen. The reception was great. Great breakfast next to the daily price. Very good dinner for the price of 10 euros.